I started out very gung ho early this morning. Got up cleaned the kitchen, cleaned out the refrigerator, made my green juice and fixed a lovely breakfast. After that I don't know what happened. I think the busy last couple of weeks caught up with me. I went back to bed and slept two hours. I never do that, but I guess I must have needed it. When I woke I could hear the sound of freezing rain hitting my windows. What a change from yesterday. It was 64 degrees and I took a walk to enjoy the warm day. Winter just doesn't seem to want to let go of its icy grip just yet. But yesterday there was this. 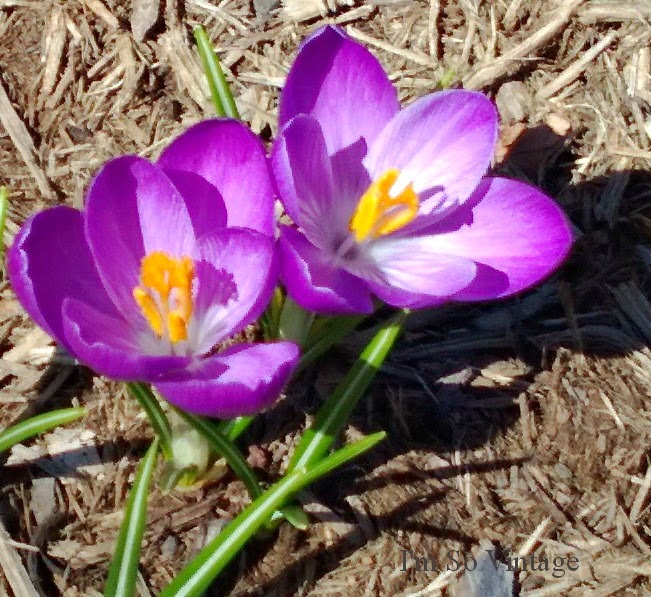 Oh little purple crocus how you made my heart sing. What joy there was to see your beautiful face. 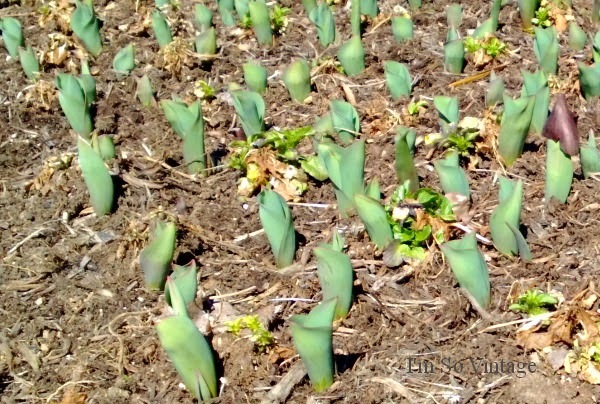 As I returned home I saw that the tulips were three inches out of the ground. So, Old Man Winter, you can have your last bit of fun, because you won't last long. Tuesday the temperature will climb back up to 60 degrees and I will be on the hunt for some daffodils. Spring officially arrives in four days and I cannot wait to shut the door on winter. I hope you are seeing some signs of spring, too. I've been napping on the couch today -- trying to watch a movie that I'd recorded and kept going to sleep! I gave up and cleaned the kitchen and then came here to my computer.... finally woke myself up! 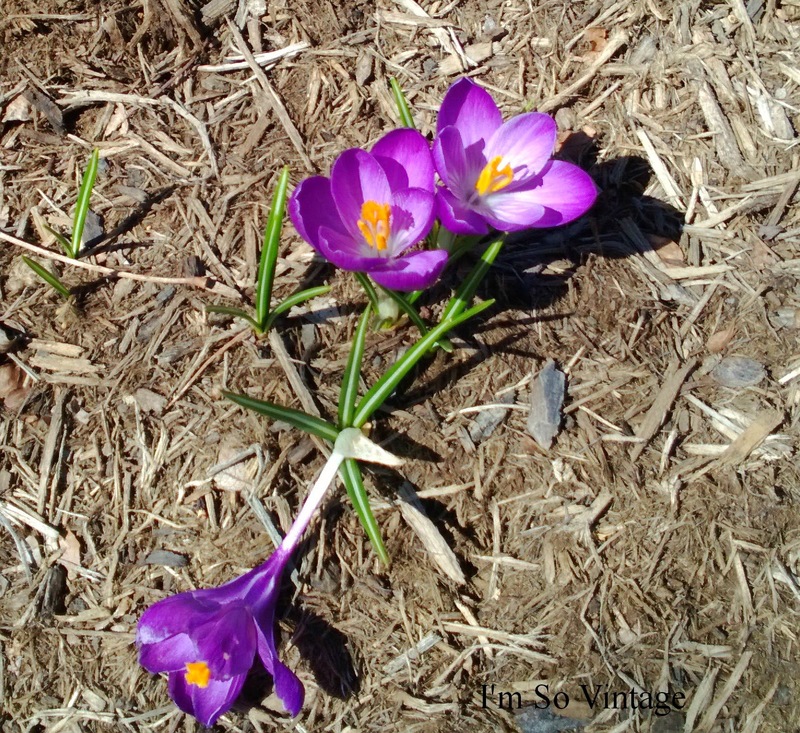 Your crocus is so pretty and it looks like you'll have a nice bunch of tulips! I need to plant some one of these days! I think it is a lazy getting over winter kind of day. Oh, how those first signs of spring bring joy to my heart! Don't they? It just makes you feel like there is an end in sight. What gorgeous flowers. I hope it warms up there soon. It was 'warm' here today and we hiked...I'm beat! Saw lots of wildflowers though. Enjoy your afternoon my friend! Sending you some warm hugs! I can't wait until we have wildflowers. Warm hugs back. I hate that winter is still hanging on. I did almost the same thing you did as we had a house showing scheduled for 9:30 this morning so we went and ate breakfast then we came home and took a long nap. It's been a relaxing day except for having the house ready for a morning showing. Selling your house is so stressful. I hope you get it sold soon, my friend. We spent yesterday at the ball park in Bowling Green. Now we have a coating of sleet! Yuck! and woke up this morning to a coating of sleet and snow. DOUBLE YUCK!!! Those flowers are beautiful! I wish I had more bulbs planted so I could enjoy flowers popping up through the ground. It was cold and rainy here today and will continue into tomorrow. Glad that you were able to have at least one good day to enjoy getting out! Thanks, Kelly. It is so nice to see a promise of spring. Such gorgeous pics!! Maybe if I get my shovel busy, I could dig my way to some tulips too.....probably not, but a big thanks for sharing yours!! I would be SO excited by the crocus and tulips...I have no sign of anything! I think your body tells you when you need extra sleep. I find that when I'm busy several days in a row, I'm dragging when it's over. And I have trouble sleeping...on nights that I get only 5 hours in, I push myself but sometimes cave in for a nap. I hope you get some soon, Susan. Me too, Linda. Woke up to snow on the ground this morning, but fortunately it all melted and back up to 60 tomorrow. Looks like spring is around the corner for you. :) I love tulips!